Downwell is pretty much a perfect game. With an extremely simple and well-executed concept, responsive 2D platforming controls, and a cheap price tag, Downwell is a perfect bite-sized and addictive retro platformer that I can’t recommend highly enough. 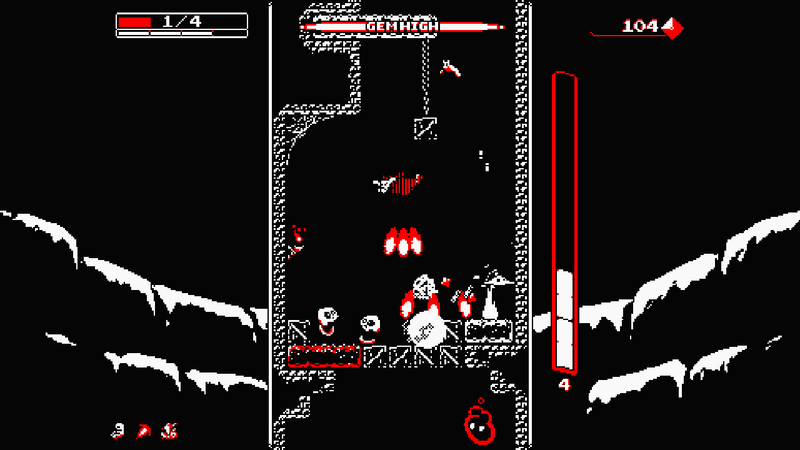 See our full Downwell PS4 review for all of the details. 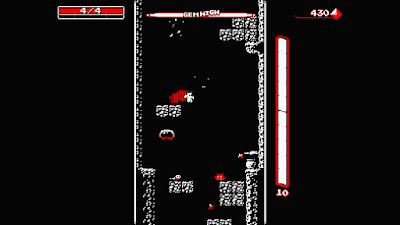 Downwell is a retro inspired 2D vertical platformer / shooter where your character is falling down a well full of weird creatures and traps. They are equipped with a pair of gunboots that shoot downward that act both as your means of attack against enemies, but also as a means of propulsion and movement. The deeper into the well you go, the more challenging the platforming becomes and the more dangerous the enemies and traps are. The well is split into sections – the first being fairly normal, the second being a catacomb full of ghosts, and the third and below being underwater so you have to refill an air tank while also fighting and platforming. The game gets more and more difficult the further down you go, but you also have a wide range of upgrades and weapons to choose from to make things (slightly) easier. There will be side rooms you can duck into on the sides of the well that will change your weapon – machine gun, shotgun, laser, burst, etc. – or refill a section of health. You can also stomp on most enemies’ heads, Mario style. As you fall you also collect gems that can be spent at randomly placed shops where you can buy health or extra shots for your weapons. At the end of each level you also can choose an upgrade that will do things like give you a drone buddy, cause bullets to shoot up when you destroy blocks or enemies, and many other upgrades. The idea is to merely make it to the bottom of each level and move on to the next, but there are some strategies involved as well. Killing enemies and destroying blocks earn you gems, and killing successive enemies without touching the ground results in bonuses that really add up. You can play without worrying about gems at all and skip all the shops, or you can collect as many as you can. It’s all up to you. And if you make a poor choice, it doesn’t really matter because this is a roguelike and you start over at the beginning when you die anyway. One thing about the game, though, is that the upgrades you choose from at the end of each level are random and some upgrades are much more useful than others. Getting the upgrades that cause bullets to shoot up when you destroy enemies or blocks or when you collect gems early on makes a huge difference, for example. This means that success or failure is not only up to your skill, but up to random chance a bit as well. The game makes a wide variety of playstyles viable, though, so do whatever you want. Here is what makes Downwell so great: It is extremely fast and addictive and a run down the well is only going to take a few minutes. When you fail miserably because of bad play or lackluster upgrades, you only wasted a minute or two. Or when you play extremely well and have a great run, it only took ten minutes at most. When you die you restart instantly so you just keep playing and playing and playing over and over again. It’s a ton of fun and very addictive. And the best part is that it is only $5. Presentation-wise, Downwell is an extremely simple 8-bit (or less?) 2D platformer that only ever displays a couple of colors onscreen at once. The default palate is red, black, and white, but you unlock a wide range – including a green monochrome original Game Boy scheme – as you play. I have to say, though, that none of the other color schemes really look as good as the default, so that’s what I stuck with. Music and sound is totally appropriate bleeps and bloops and is perfect. 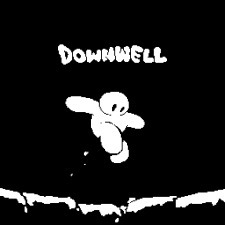 All in all, Downwelll is a must own title for PS4 owners. At just $5 you are getting a pretty much perfect experience. It looks and sounds great, plays fantastically well, and is incredibly fun and addictive that will keep you hooked for far longer than most modern full-priced games. Buy it. Don’t hesitate. Just buy it. 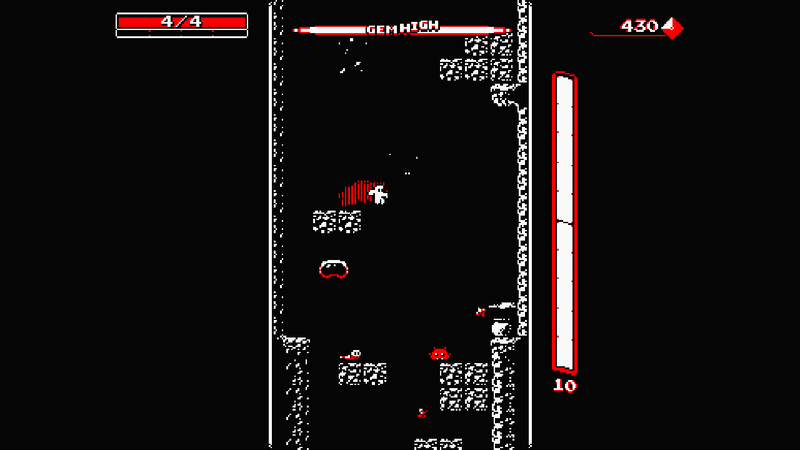 Downwell is awesome.